On July 14, 2017, a 57-year-old tourist from New Zealand was killed on the Dutch Caribbean island of Sint Maarten (pictured above) when she was blown off her feet by the jet blast of an airliner. The woman, one of hundreds who congregate daily on Maho Beach near Princess Juliana International Airport to watch aircraft take off and land almost within touching distance, is reported to have struck her head during the incident and died shortly after. 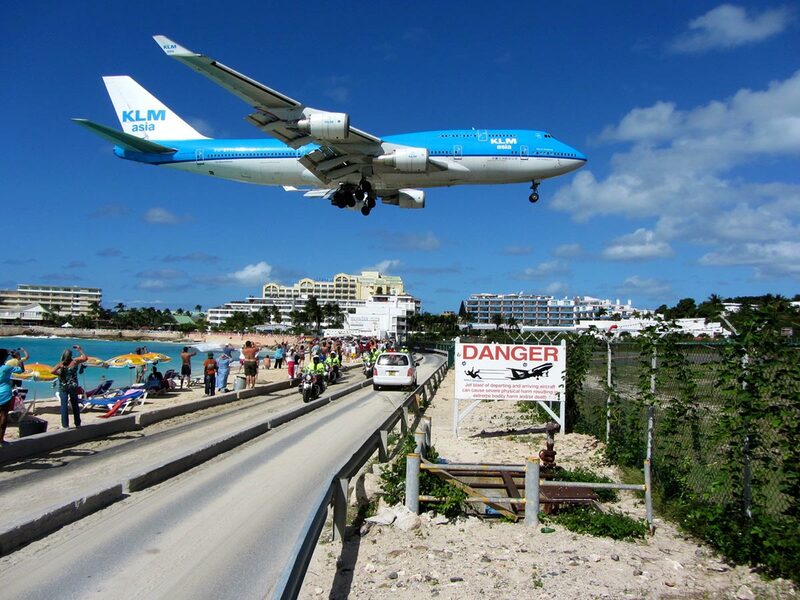 Despite a heavy police presence and local authorities posting warnings of the dangers of this tourist activity, Maho Beach is world-famous—not just with plane-spotters and beachgoers like the New Zealand traveller, but also with selfie-hunters, bloggers and vloggers. Although the unfortunate traveller was the first reported fatality at the site, there have previously been several serious injuries that ended in hospitalization. But no amount of warnings or reports have so far deterred people from making the trek to Maho. Why do people flock to watch planes descend a few metres over their head? Well, it’s an adrenaline rush you can get without falling from the sky. Hot-air ballooning and parasailing have long appealed to adrenaline-hungry travellers who might otherwise not engage in such daring activities at home. It’s something to boast about to your friends back home. And with the rise in quality of smartphone cameras, paired with social media platforms that basically encourage such stunts, a new adrenaline sport of sorts has emerged: the dangerous selfie. Whether perching over the edge of a precipitous cliff or posing on the top of a high building, the riskier the venue, the more popular the selfie. What people tend not to realize is that many of these activities—even when handled by licensed professionals, as in scuba-diving—are often not covered by travel health insurance if they end in disaster. While many insurers bend over backwards to assist their clients and to provide first-rate medical care in an emergency, industry leaders overall want to ensure customers are better informed to avoid the sort of misunderstandings that can result in crippling unpaid hospital bills and lawsuits. Partly with that in mind, Canada’s Travel Health Insurance Association (THiA)—an organization that represents more than 150 travel insurers, brokers, emergency assistance companies and other related businesses—recently introduced a new Travel Insurance Bill of Rights and Responsibilities. At their announcement, THiA revealed that 95 percent of all submitted travel health insurance claims in Canada are paid by the insurance provider (based on a KPMG survey of Canadian providers commissioned by the association). While that’s an impressive number, it’s of little consolation for the other five percent who have been left unpaid. It’s often because they failed to read their policy’s fine print (note: always read the entire policy before you purchase, especially the fine print), or they purchased the wrong policy for their needs—beware of trying to save money by cheating yourself of full or proper travel health coverage. Sometimes it’s because they travelled with pre-existing conditions and didn’t disclose that to their insurer, or were engaged in activities that went against the policy’s terms and conditions. One of the main objectives of this bill of rights is to provide Canadian travellers with a clear statement of what they can expect from their travel health policies, and it includes what the THiA consider to be the three key elements of successful travel insurance. Assisting the customer to purchase the correct type of insurance for their specific travel. THiA hopes that by introducing this new Bill of Rights and Responsibilities—by which all their member organizations are now bound—they can improve customer satisfaction. Ultimately, however, it is your responsibility as a traveller to ensure you purchase the correct health insurance coverage for your needs, and that you know and abide by its fine print. Ensuring that your insurance provider is a signatory of THiA’s new Travel Insurance Bill of Rights and Responsibilities is a great first step. To Be Informed: You will receive your policy documentation and confirmation of coverage outlining the policy terms and conditions whether purchased in person, over the phone or online. To Request Clarification: You may ask questions about the travel insurance you have purchased. To Review & Modify Medical Screening: You will receive a copy of the answers you provided on the medical questionnaire prior to the start of your policy. To Receive Worldwide Assistance & Toll-free Support: You have 24/7 access to the help you need when you need it from your travel insurance provider. To Fair & Prompt Claims Handling: You will have a timely and transparent communication process. To Escalate & Appeal: You may challenge decisions and request additional reviews with new information. To Confidentiality: Your personal information will be protected in all dealings with your travel insurance provider. To Know Your Insurer: Your policy will clearly identify the underwriter of your travel insurance and the process to file and resolve complaints. To Your Preferred Language: You may transact and correspond about all components of your travel insurance in English or French.